Heathers are one of my favorite winter-interest plants. There are Ericas (Heaths) which bloom around November and December, Daboecia (Irish Heath) which bloom spring to late fall, and Callunas (Scotch Heather) which bloom in summer but often have vibrant winter foliage. 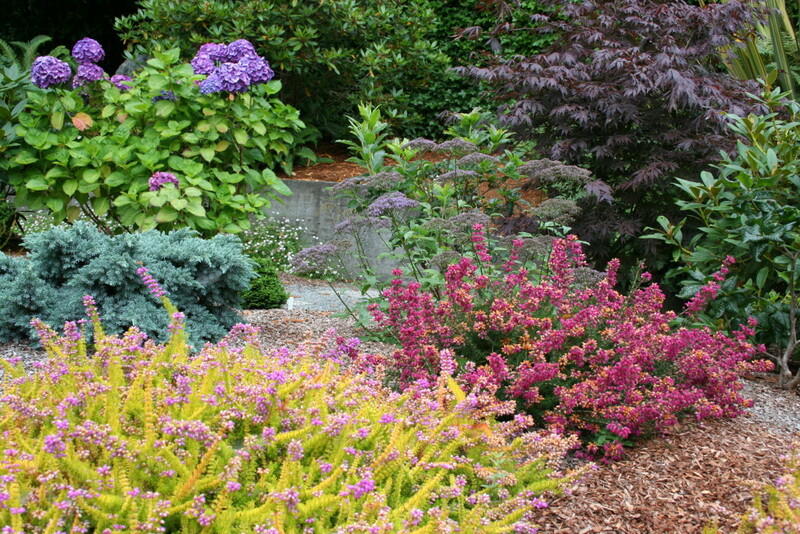 They are very low-maintenance plants, but they do need pruning once a year after they bloom. Check out this video on how to prune a Scotch Heather in the fall; you can also use the techniques shown to prune a Daboecia in late summer, or Erica in winter. Nice tutorial video! Your camera person did a great job focusing on the topic and subtlety moving the camera shots away from the dude who seemed to want to be featured in your video. I linked to you from C.L.’s ‘Whole Life Gardening’ blog. Thanks Aerie-el! I definitely learned a lot on that first video – the ones I’ll be posting soon have a lot less background noise. We definitely get a lot of “interesting” characters in this town! LOL. i have 4 heathers that need the same haircut, but mine are flowered on the tips with green but are dead wood like at base, “have been that way for 2 seasons”, they just get taller and taller, no green at base like yours. can i still cut and get a beaty next year? Depends on the variety. I’ve had some luck cutting Ericas to hard wood (just wood, no leaves). If you have a Calluna or Daboecia, though – neither of them responds well to hard pruning, and if they are woody inside to where it is ugly, I’d just replace them. They often get woody like that if they aren’t pruned every year after bloom, and sometimes that happens in time even with a yearly shearing. If you don’t know what kind you have, try doing a google image search or looking at the heather society website for photos and guidance in identifying them. Or email me a good up-close photo (my email’s on the contact page) and I can tell you. I have huge old heather bushes on a hillside that have not been pruned in years the inside core is all dead with just green on about a foot at the ends. Pretty big ball of green heather but it keeps stretching down hill and the base is nothing but brown woody stalks. Can I trim it back to just wood stocks? Will it send out new shoots? Depends on the variety. I’ve had some luck cutting Ericas to hard wood (just wood, no leaves). If you have a Calluna or Daboecia, though – neither of them responds well to hard pruning, and if they are woody inside to where it is ugly, I’d just replace them. They often get woody like that if they aren’t pruned every year after bloom, and sometimes that happens in time even with a yearly shearing. If you have a Daboecia, I’d try it as sometimes there is success – if it’s a Calluna, nope, pruning to wood will def. kill it. Your website is very helpful and your video on pruning as well. Thank you. My question is about pruning the other heathers/heaths. Would it be the same? Or not at all? A gardener-friend of mine came over to our new place on Whidbey and without saying anything trimmed the edges of the heather along the walkway- now I’m not sure which kind this is except that over the year we’ve had this place it’s almost always had some blooms – the dullest it’s been has been winter, and no new growth so far, showy or otherwise. Did we make a big mistake on that? Or will some new green pop out in spring? A local gardener has told a friend of mine that you can set light to heather to prune it down to the ground. I don’t believe him when it comes to garden heathers with shallow roots. Heathers on heathland do sometimes catch fire owing to long hot summers and they do regenerate in time I suppose. Would you agree that one should’nt burn “garden” heathers because of their shallow roots.? I’d try renovation. If you’re willing to remove it, then you really have little to lose. Thank you so much.your video really helped me to prune my heather’s correctly. I am from England. Best Wishes Sandy. I like your videos. I just saw them on youtube…and love the one with your white kitty helping as you cut and tossed the stems on the ground. Thanks for the information!